1. Redecorate the bathroom. This room often gets overlooked, but have you ever thought about how much time you actually spend in this room? Paint the walls a relaxing color, hang interesting art, or consider new lighting or cabinetry. 2. Install a new dining room light fixture. Creating a focal point over the dining table helps set the tone for the room as a place to eat, share, and be with loved ones over great food. Use a telescoping ladder or a compact step stool to reach the ceiling and install a light fixture over the dining room table. 3. Hang wallpaper. Add texture to walls with decorative wallpaper. There’s a lot to choose from, so this isn’t your grandmother’s wallpaper. 4. Decorate the nursery. There are a lot of options here – consider soft, comforting lighting, fun mobiles over the crib, wallpaper or paint, and more! Having a ladder to help hang mobiles or paint will make this job much easier on the arms. 5. Create a focal gallery wall. Display your art collection on a large loft wall, in your living room, or along a stairway. Use string and a level to hang everything on a grid. Starting the grid up high draws the eye upward, creating the illusion of a bigger room, so you’ll need to reach a high point on your wall to set your grid. 6. Install garage shelving. Nothing is worse than a garage that you cannot use (or one that is cluttered with big ladders!). Get your belongings up off the floor and organized along shelves by installing shelving in your garage. 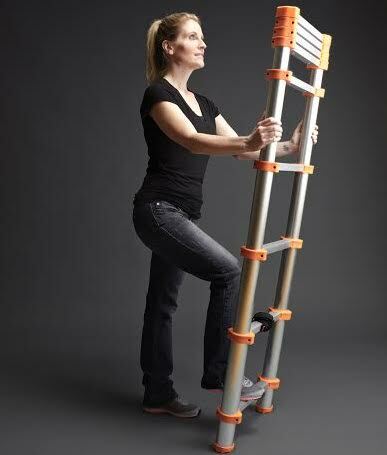 When you’re done using your telescoping ladder, fold it up and put it on a shelf! 7. Install a bike rack. For those without much extra space, having a bike rack can save a lot of floor space. Hang a hook on the ceiling, mount a rack to the wall, or find a rack that is tension-mounted between the floor and ceiling. For even more project ideas, check out our recent post: Seven Things To Do This Weekend With Your Telescoping Ladder.